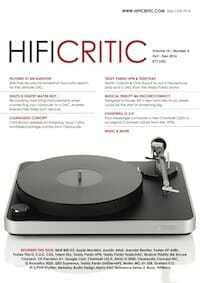 The latest feature packed issue, Volume 10 Number 4 of our HIFICRITIC high end audio magazine there is a fantastic compendium of reviews and features. It is something of a digital audio issue covering potentially 21 digital audio players, hardware and software, of one kind and another. 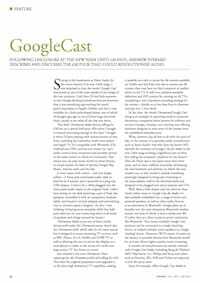 Andrew Everard casts his critical eye over Google Cast a built-in version of Chrome for music, also reviewing in depth the increasingly popular music replay control programme ROON, also now featured with many new digital audio players. We include the versatile and eye-catching the Chord Dave DAC. On an informal basis the new Berkeley Audio Alpha Reference 2 figures in a major comparative survey of six high end DACs by ultra enthusiast Bob Pyle, grilling them to red heat in his ultra low noise top end system which is founded on the Magico Q5. DACs he auditioned included the Metronome C8, the DCS Vivaldi V2.0 the Audio Note Signature 5, the Trinity and the CH Precision C-1 DAC-Pre. Also figuring in the issue is a follow up for the Berkeley from Martin Colloms, while noting that this intriguing high performance design is not distributed in the UK. Meanwhile Julian Musgrave continues his philosophical discussion on perceived distortion, questioning our precepts about measurements and sound quality. Five loudspeakers grace our pages, the undoubtedly accomplished top of the line B&W 800 D3, reviewed by Paul Messenger, and also that ultra value, direct sale Norwegian introduction Arendal; here we review their smallest, the Monitor, in fact turning out to be a hefty and powerful stand mount. At the budget end we have fitted in a sweet sounding compact model, the inexpensive 3020 from Q Acoustics. The Editor has his own collection of BBC LS 3/5a so it was right that he should audition yet another revival of this model, claimed to be still more authentic, namely the Graham Audio built Chartwell LS3/5 (and with no ‘a’ suffix). 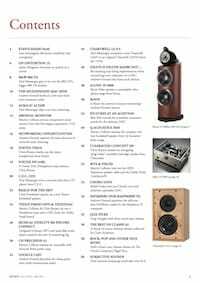 More loudspeakers include a surprising little Totem called Sky, this review penned by Chris Frankland. Some accessories are reviewed including the well known Teddy Pardo Power Supply for the Naim UnitiServe. Whilst we were at it we also took in the Teddy DAC and the Teddy Headphone Amplifier, these two having made a promising impression at the recent NAS audio show. Paul Messenger also tries out internet streaming , making some musical discoveries along the way. Andrew Everard continues his digital audio coverage with a review of the Musical Fidelity server- streamer-DAC-Pre-ripper-store the M6 Encore, the one without the power amps He also pens an explanatory and highly informative feature on digital audio networking. Not yet finished with digital matters, he then conjures up a feature explaining how to turn an old MAC Mini into an inexpensive audio music store/server. Then he looks at the HI FI Berry (for Raspberry Pi) solution to digital audio at peanuts prices. Finally, before his Christmas closedown, he knocked out tests on a few USB re clockers. Out of the blue a very substantial and costly high end speaker cable a spiral Litz , turned up from QED, the perhaps oddly named Supremus and delivered intriguing results. On analogue replay we have the Clearaudio Concept MC turntable package, with matching arm and Clearaudio moving coil cartridge. Then phono equalization matters are served by the Allnic H-3000 Phono review by Kevin Fiske where this established reference turned in a fresh and sparkling performance. Also for audiophiles, we also have the exacting CH Precision A1 stereo power amplifier, with watch like build quality and both a sound quality and lab performance to match. Paul Messenger, sticking doggedly to some digital audio adds the legendary CEC belt drive CD-5 transport/DAC, and a new Auralic USB streamer-digital audio unit, the Altair. Headphone coverage includes the new Fostex TH 610 reference model partnered by one of their USB DAC equipped headphone amplifiers the HP-A4BL which proved quite surprising. 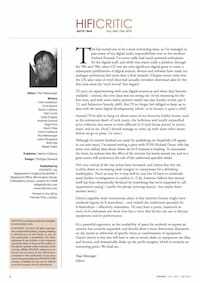 Stan Curtis pens his usual thoughtful feature on audio topics, this time musing on the audible benefits of simplicity in circuit design, a neglected virtue. Following disclosure at the new NAIM UNITI launch, Andrew Everard describes and discusses the £30 puck that could revolutionise audio.